Due to exceptional demand this machine is being supplied for delivery on the 30/01/17 all orders received will be dispatched with an extra free pack of consumables NEW!! this machine is now fitted with our new DuraSlice 80 torch for greater consumable life - increasing the cutting thickness, reliability, speed, and safety even further. 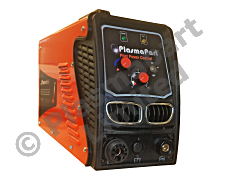 240V CUT 50 Pilot Power Control Plasma Cutter Only £665.83 + VAT! This machine has the revolutionary ability to be able to HEAT as well as cut allowing the freeing of rusted nuts etc and also bending of components, its fitted with a fully variable control for heating and a selector switch for heating mode, in normal cutting mode the machine performs exactly as the CUT 50 PilotPro. The machine is fitted with a full power pilot arc DuraSlice P80 6 metre torch making easy perfect starts every time and accurate starting points on the material as well as being able to ignite in mid air - great for burning through thick rust, coatings and paint as well as being perfect for mesh and bar materials. Clean cutting is up to around 21mm in steel plate - but some users with a steady hand can achieve severance cuts in steel up to around 25 mm! The machine is very efficient and has a very high duty cycle, 100% at 41 Amps. It features the latest MOSFET Inverter technology using very high quality Toshiba MOSFETS and is force air cooled. The machine is fitted with a Duraslice P80 6 metre torch. Also included are a pack of consumables, air regulator / filter, shade no. 5 safety glasses, earth lead and instructions.